We all want the same thing: to be happy and to be free from our pain. The problem is, we’re not 100% sure how to be happier. Sometimes, it’s the very things we think will make us happy, that disappoint or fail us in the end. Does yoga make us happier? How? Does meditation make us happier? How? In this 2-hour workshop, we’ll meditate, learn what karma really is and discuss. Through mindful journaling and meditation a life of every day bliss is possible, and the path is much simpler than you may think. 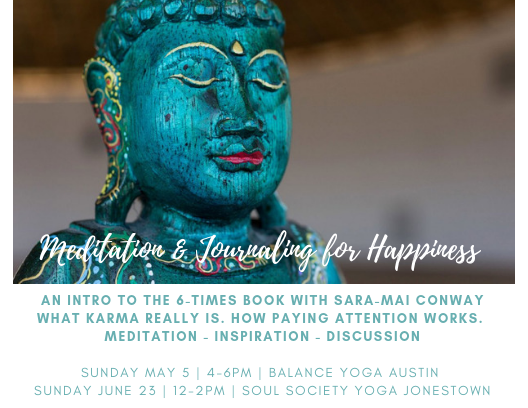 Workshop attendees will receive a journal in which to begin the ancient practice of the 6-times book, as well as two take-home guided meditations. This is an all-levels workshop open to all, whether you currently have a meditation practice or are looking to begin. How does yoga and meditation make us happy? What is karma, and how does it work?